Just as in humans, a dog’s kidneys work to eliminate waste and toxins from the body. 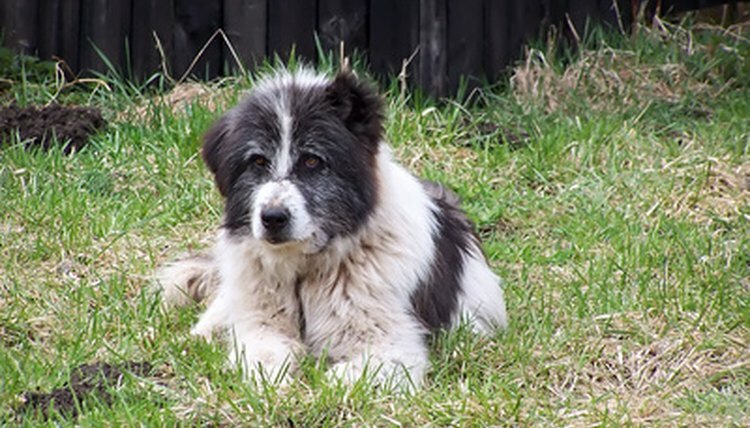 Dogs of any breed or age can suddenly develop chronic renal failure, or kidney failure, but it is also a common condition that gradually affects dogs as they grow older. When the kidneys do not function properly, symptoms of kidney disease begin to manifest. Loss of muscle control and muscle tone are just two of the symptoms that should signal to owners to seek veterinary assistance with their pets. The first and most notable sign of kidney failure is an increase in water consumption. According to professorshouse.com, this increase in water consumption, also known as polydipsia, is the body’s attempt to flush out toxins. An increase in urination, also called polyuria, is caused by increased water intake, warn the veterinarians at the Mar Vista Animal Clinic in Los Angeles. However, the dog’s kidneys cannot concentrate his urine, so it begins to appear clear, with little to no odor. A dog suffering from kidney failure will begin to display poor or unkempt fur because his body cannot retain the proper nutrients to sustain a healthy appearance. As the dog’s body combats a failing kidney system, his body will grow weak and he will lose energy. According to symptoms listed on PetEducation.com, affected dogs will also lose their desire and tolerance for exercise because of this. As with most serious illnesses, dogs experiencing renal failure will lose their appetite and begin to exhibit weight loss. A dog’s breath can always be an indicator of serious illness, according to the Mar Vista Animal Clinic’s website. If the breath smells bad, such as foul or rotten, it is a symptom of renal failure. This is because of toxins building up in the bloodstream. A dog’s body will try to release waste products and toxins any way it can once the kidneys stop functioning properly. Likewise, if enough toxins are released into the body, vomiting and diarrhea usually occur. In the late stages of kidney failure, dogs will begin to lose control of bodily functions and movement, according to PetEducation.com. Ulcers can appear in the mouth, most commonly on the tongue, gum or inside of the cheek as a side effect of the anemia that sometimes occurs with kidney failure. Dogs experiencing enlarged or painful kidneys will often begin to hunch over or show a reluctance to move, according to PetEducation.com. High blood pressure, another symptom of this condition, can cause a dog’s eyes to change appearance.